Lucero brings their whiskey-soaked cowboy punk to Colorado this weekend, with shows in Aspen Thursday, at Denver’s Bluebird on Friday night and the Fox Theatre in Boulder on Saturday. As I am wont to do, I’ve been trolling the internet in preparation for the show, seeing what Ben Nichols and Co have been up to since the 2006 release of Rebels, Rogues and Sworn Brothers (listen to “I Can Get Us Out Of Here Tonight” and sit back in bliss). Check Lucero out this weekend if you are here in Colorado, or on one of the other tour dates leading up to the summer release. I hear Ben Nichols has also been playing some of his solo material from the Cormac-McCarthy-inspired album Last Pale Light Of The West. This is a very good thing. Tagged with ben nichols, lucero. I’ve been looking forward to this one for awhile now. I saw Ben play as part of The Revival Tour last October. He did some things of Last Pale Light in the West. I love Todd Beane’s pedal steel accompanying Ben’s growl. 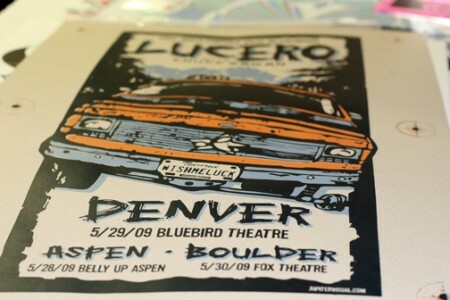 Last July Lucero hit up the Black Sheep. I remember you had to miss that one. I’m looking forward to Friday night up in Denver. I saw Lucero last week in Chico, with Black Joe Lewis opening. Amazing show. Will definitely be getting to know both bands better in the near future. Will do whatever i have to do in order to see either of them play again in the future. I saw them in Seattle on Friday. As always, a great show. They played a number new songs including Sounds of the City and Darken My Door. Ben also did several of the Last Pale Light songs solo. Sorry you won’t be seeing Black Joe Lewis at the Colorado shows though. They were fantastic. Well worth checking out live. Thanks for the heads up! I saw your post yesterday about the Lucero show and caught it at the Bouquet last night in Boise. First time I’ve seen them and they put on a kickin show. I’m not overly familiar with their music yet, but some of the songs I recognized were I Can Get Us Out of Here, Drink Til We’re Dead, I’ll Just Fall, My Best Girl, Darken My Door, and What Else Would You Have Me Be. Chuck Ragan opened and he was gruff voiced, powerful and rockin. Unfortunately, I didn’t see any advertising for the show, so I would have missed it if it weren’t for your post. Thank you. I really appreciate it. It’s a boot stompin good time. The Bluebird show was an awesome blend of old and new. They have never sounded better. Sorry we missed ya Heather. The song is Drink Till We’re Gone ..not Drink Till We’re Dead.. but I think a rename may be in order! This was perhaps one of the worst performances I have ever seen. He started pounding shots of whiskey as soon as he hit the stage. I’m all for having a little fun on stage, but Ben took it a little too far. By the end of the night, Ben was so drunk he couldn’t even remember the words to his own songs. He frequently played half a song, and stopped right in the middle of several others. The only thing going through my head by the end of this show was “I paid six dollars to see this! ?” Honestly, I didn’t see anything special at all on that stage, even when he was relatively sober. Let me just say lucero is my favorite band. I have been looking forward to a new album for years. I am so devastated over the new songs, the damn horns are all I can here. This is a sad day. I’m not in to swing music.